Froth Treatment is a process by which water and fine solids are removed from bitumen froth produced in Extraction using hydrocarbon-based gravity separation. In a Paraffinic Froth Treatment facility, a paraffinic solvent is used as the diluent, producing a very clean final product that can be sold directly to market without an upgrading step. Bitumen froth produced in Extraction is typically 60% bitumen, 30% water and 10% fine solids. This product requires further cleaning before the bitumen can be upgraded to crude oil or sold to market. Since no further cleaning can occur by water-based gravity separation, a light hydrocarbon is added to the froth in order to reduce viscosity of the bitumen and enable a more effective gravity separation. This process is typically referred to as Froth Treatment. There are 2 types of Froth Treatment processes used in the oil sands: naphthenic and paraffinic. The difference lies in the type of hydrocarbon solvent used to dilute the froth. Solvents containing primarily paraffin hydrocarbons are called paraffinic. Solvents containing primarily naphthene hydrocarbons are called naphthenic. The choice between a naphthenic or paraffinic solvent depends on the desired product quality. Solvents that contain more paraffins produce a better quality product than solvents that contain more naphthenes. Naphthenic Froth Treatment (NFT) was the original (and only) technology available in the oil sands for over 30 years. In an effort to produce a better quality bitumen product, Paraffinic Froth Treatment (PFT) was first commercialized by Albian Sands in 2002 and is now the preferred technology for those operators who do not have access to an upgrader in close proximity. The main difference between Naphthenic and Paraffinic Froth Treatment is the type of hydrocarbon used to dilute the bitumen froth. A PFT process uses a much lighter diluent (typically referred to as solvent), which facilitates the precipitation of asphaltenes. As asphaltenes get precipitated, any remaining water and fine solids trapped in the bitumen get bound to the asphaltene precipitates, leaving behind a very clean bitumen product that meets pipeline specifications. Since the diluted bitumen produced from a PFT facility has almost no water or solids, the product can be sold directly to a high-conversion refinery, without needing to be upgraded. Note that since PFT bitumen still contains about 10% asphaltenes and a significant amount of sulphur, this feedstock would not be suitable for a conventional refinery which is traditionally designed for light/sweet crude oil. A majority of the fresh solvent is added to the last stage of the Froth Settling Unit, where the settler overflow is pumped back to the feed of the previous stage settler. This overflow stream is mostly solvent, often over 98%. The overflow of the first stage settler is the final clean product, sent to the Solvent Recovery Unit. This product is an almost-pure mixture of bitumen and solvent, with less than 0.1% water and solids. Steam is used in the Solvent Recovery Unit to vapourize the solvent, which is recycled back to the front end of the process. The underflow of the first stage settler is fed to the second stage unit. This stream still contains a significant amount of bitumen and solvent, which is recovered by the second stage settling unit. Note that since the process is counter-current, the solvent-to-bitumen (S:B) ratio is highest in the last stage (where fresh solvent is first added) and lowest in the first stage. The underflow of the second stage (or the last stage in the case of a three-stage process) contains virtually all of the water and solids originally held within the bitumen froth, as well as up to 50% of the heavy asphaltene portion of the bitumen. This stream also contains a small amount of solvent (in the order of 5%) which needs to be recovered in the downstream Tailings Solvent Recovery Units. Tailings Solvent Recovery Units are a group of flash columns, arranged in series or parallel. Steam is added to the columns to vapourize the solvent from the tailings stream, which is recycled back into the process. The final tailings stream is sent to the Tailings Pond for storage and eventual reclamation. Note that this is a generic, simplified PFT flowsheet and does not represent the exact process configuration. The number of stages of equipment, type of equipment used and piping configuration will vary among the different operators. Also note that all Froth Treatment facilities are closed circuits, with all hydrocarbon vapours captured in Vapour Recovery Units (not shown) which collect, condense and recycle the solvent. DID YOU KNOW? Paraffinic Froth Treatment was patented by Syncrude in 1994. Syncrude made the use rights available to all members of an oil sands Froth Treatment consortium, allowing the process to be implemented at other oil sands operations. Although PFT is a relatively new technology, equipment design and their relative configuration are quite similar across the different operators. Some key features of equipment used in PFT are listed below. FSUs are gravity separation vessels used to remove solids, asphaltenes and water from diluted bitumen froth. There are two types of FSUs: (1) large clarifiers with a shallow-sloped bottom and internal rakes, and (2) smaller vessels with a steep cone bottom and no internal moving parts. PFT facilities produce a clean diluted bitumen product, containing as much as 60% solvent. SRUs are flash columns which recover and recycle some or all the solvent. This minimizes the volume of solvent shipped in third-party pipelines. PFT facilities produces a tailings stream that consists of fine solids, water, asphaltenes, bitumen and solvent. TSRUs are flash columns used to strip-off and recycle the solvent. The solvent-free tailings can then be disposed in the tailings pond for future reclamation. As in all hydrocarbon circuits, all PFT equipment are connected to Vapour Recovery Units (VRUs) which capture, condense and recycle solvent vapours. Paraffinic solvents are predominantly normal and iso-hydrocarbons in the C4 to C20 range. Solvents used in PFT facilities typically range from n-pentane (C5H12) to n-hexanes (C6H14) hydrocarbons. As a general rule, a good quality paraffinic solvent should contain no more than 3% olefins, aromatics and naphthenes, which are considered impurities. Paraffinic solvents typically range in density from 625 to 670 kg/m3 and have a relatively low boiling point, anywhere from 25 to 40°C. to reduce the viscosity of the bitumen, enabling water and solids removal by gravity separation. to precipitate asphaltenes, which bind with water and solids, leaving behind a bitumen product that is virtually free of impurities. As the paraffinic solvent is added to the bitumen froth, asphaltenes begin to precipitate out of solution, binding with water droplets and mineral solids. These precipitates join together to form asphaltene clusters which settle to the bottom of the gravity separation vessels. This avoids the significant formation of emulsions, which is problematic in the traditional Naphthenic Froth Treatment process. This lack of emulsions allows for a simpler process with far less equipment and fewer moving parts. WHY MORE ASPHALTENE PRECIPITATION IS NOT BETTER: Bitumen product quality does not improve at higher asphaltene precipitation rates. Water and solids are knocked-out of the bitumen at the initial onset of asphaltene precipitation. Virtually all the water and solids are removed at only 2% asphaltene rejection. The need to reduce asphaltene content below 10% is driven by product viscosity specification for pipelines and high-conversion refineries that cannot handle a large fraction of heavy asphaltenes. Removing more asphaltenes than required lowers product yield, which translates into less revenue. 1. The fraction of asphaltenes that need to be precipitated: The amount of asphaltenes that need to be precipitated is typically about 50%. Oil sands is mined from the Athabasca Basin, which typically contains about 17-18% asphaltenes, far too high for any refinery. The asphaltene content needs to be reduced to less than 10% before the product can be sold to a high-conversion refinery. As a general rule, a lighter solvent (such as a C5 pentane) will produce larger and more dense asphaltene clusters versus a heavier solvent, such as C7 heptane. A lighter solvent also requires a lower S:B ratio to remove asphaltenes from solution. For example, if the target is to remove 50% of the asphaltenes in the bitumen, then a ratio of 1.6:1 solvent:bitumen is needed if using a C5 pentane, versus a ratio of 3:1 if using a heavier C7 heptane. Therefore, a process that uses more C5 would require much less solvent, translating into smaller process equipment. However, lighter solvents have a lower boiling point, which requires the process to run at a higher operating pressure in order to keep the solvent in the liquid phase. The trade-off of a lighter solvent is a more volatile process, which needs a higher operating pressure. Solvents used in PFT facilities are mostly in the C5 to C6 range, which can be quite volatile at ambient temperatures. results in less solvent reporting to the tailings stream, requiring less TSRU capacity or fewer TSRU vessels to recover all the solvent. Although a higher S:B ratio increases the settling rate, the relationship is not linear and quickly levels off. S:B ratios used in PFT facilities are normally in the 1.5 to 2.0 range, more than double the ratios found in NFT. This ratio is required to achieve 50% asphaltene precipitation as required by the product specifications. Operating at much higher ratios does not improve the settling rate an does not benefit the process. 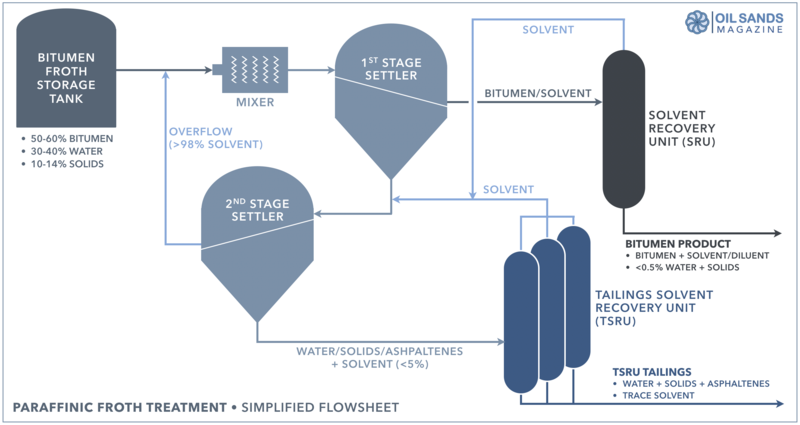 Note that all S:B ratios refer to the solvent to bitumen ratio in the first stage settler only, since only the first stage produces final product. S:B ratios in subsequent stages can be substantially higher since they contain far less bitumen. As expected, increasing the process temperature decreases the viscosity of the bitumen/solvent mixture, which increases the settling rate of the asphaltene agglomerates within the vessel. Therefore, if all other variables are held constant, operating at a higher temperature reduces the required residence time and size of the settling vessels. Most PFT facilities operate in the 70 to 90°C range, with the exception of Muskeg River Mine which uses a low-temperature/low-pressure PFT process. Since Muskeg River operates in the 30 to 40°C range, the settling rate of the asphaltene agglomerates is much slower, therefore requiring much more residence time and much larger settling units. A high temperature PFT process by comparison has much smaller vessels. The trade-off of running at higher operating temperatures is that the process needs to be designed for a higher pressure in order to keep the solvent in liquid phase and prevent it from vapourizing. Paradoxically, for a given S:B ratio, more asphaltenes are precipitated at lower temperatures. This is because asphaltenes are colloidal suspensions which have a lower solubility at lower temperatures. However, since bitumen viscosity is very high at low temperatures, these precipitates do not settle, making gravity separation less efficient as the temperature decreases. That's why a low-temperature PFT process (such as Muskeg River Mine) requires much larger settling vessels. In general, increasing the operating temperature lowers the solution viscosity and promotes the formation of larger asphaltene clusters, significantly increasing the settling rate of these clusters. This translates into less residence time required by the process and smaller gravity separation vessels. However, since paraffinic solvent has a low boiling point, the vessels need to be pressurized in order to keep the process in the liquid phase. The curves plotted below show the boiling point (°C) of C5-pentane (red) and C6-hexane (blue) at a given pressure. Solvent is in the liquid phase on the left side of the curve and vaporizes into the gas phase on the right side of the curve. As shown in the phase diagram below, a lighter solvent (such as C5) has a lower boiling point than a heavier solvent (such as C6) at a given pressure. Solvent must always be in the liquid phase during the PFT process, and therefore the pressure must be maintained above the curve. As a result, PFT facilities which use a lighter solvent must run at a higher pressure in order to keep the solvent in the liquid phase. As the temperature increases, the operating pressure required to keep the solvent in the liquid phase also increases. 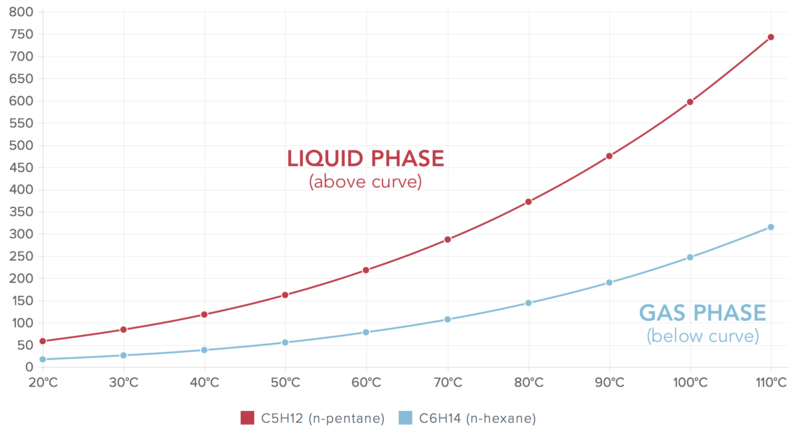 For example, if the process operates at 70°C, the minimum pressure required to keep C6-hexane in the liquid phase is 107 kPa, but a lighter C5-pentane would need a much higher minimum pressure of 287 kPa. Note that Muskeg River is the only PFT facility that operates at relatively low temperature (below 35°C). The settling vessels can therefore operate much closer to atmospheric pressure without vapourizing the solvent. Due to the presence of asphaltenes in the process fluids, defoamers and dispersants are commonly used as process aids in PFT facilities. One of the biggest challenges of PFT is the precipitation of asphaltenes, which are sticky, tar-like particles that have a tendency to bind together and plug-up equipment. As the asphaltenes agglomerate, they also tend to trap solvent within the clusters, which prevents full solvent recovery in the TSRU vessels. Therefore, it is highly desirable to keep the asphaltenes dispersed. Asphaltene dispersants are polymeric surfactants which bind to the asphaltenes, preventing them from agglomerating together. The dispersants form a hydrophilic coating around the precipitated asphaltenes, making them more likely to stay "dispersed" in the water phase. Ideally, dispersants should be added before the froth and solvent are mixed (prior to asphaltene precipitation) but can be added anywhere agglomeration or plugging can potentially be a problem. Defoamers are typically added to the feed of the TSRU. Defoamers are also surfactants that act to destabilize the foam. These chemicals can be injected into the hot water sprays or fed directly into the TSRU feed. Since PFT facilities precipitate about 50% of the asphaltenes contained in the bitumen, this results in a lower bitumen recovery rate for the overall processing plant when compared to NFT. Although the Alberta Energy Regulator (AER) mandates a minimum bitumen recovery rate for all oil sands mining operations (typically about 90%), this excludes asphaltene losses in Froth Treatment but includes any losses in the form of maltenes. This is due to the fact that these heavy asphaltenes would typically be removed as coke material in the upgrader. On average, Bitumen Production facilities lose about 8% of the bitumen during Ore Preparation and Extraction. During Naphthenic Froth Treatment, about 2% of the bitumen is lost as maltenes, which counts towards the overall bitumen losses for the facility. Therefore, for every 100 barrels of bitumen contained in the mined oil sands, an NFT facility produces about 90 barrels of bitumen product which can be processed in an upgrader. The upgrader would then remove the heavy fraction of the bitumen as coke material. In contrast, a PFT facility loses 2% of the bitumen as maltenes and about 8% as asphaltenes. Therefore, for every 100 barrels of bitumen contained in the mined oil sands, a PFT facility produces about 82 barrels of bitumen which can be processed directly in a refinery. This is why PFT facilities have a lower yield. Therefore, a PFT facility that produces 100,000 barrel per day of bitumen actually has the same processing capacity as an NFT facility that produces 108,000 barrel per day of bitumen (in other words, both facilities would have to process the same amount of mined oil sands). MALTENES EXPLAINED: Maltenes are cyclic compounds associated with asphaltenes that help keep asphaltene platelets in suspension. Maltenes are soluble in paraffinic solvents such as pentane and heptane and get left behind when the asphaltenes precipitate. On the surface, PFT appears to be a superior process over the original NFT design. However, PFT has added complexity and some important drawbacks that need to be considered. Some key pros and cons are listed below. PFT produces a very high quality partially de-asphalted bitumen, with very little solids and water that can be sold directly to a high-conversion refinery without the need for upgrading. This eliminates the need to build upgraders, which are highly complex, labour intensive and expensive. Since the process produces fewer emulsions, cyclones, centrifuges and filters are not required, making the process simpler, lower maintenance and less power intensive. Since paraffinic solvent has a relatively low boiling point, solvent recovery requires less heat and steam, making the process generally less energy intensive. Eliminating the upgrading step also reduces upstream GHG emissions for each barrel of oil produced. Paraffinic solvent has a low boiling point, making it more volatile at ambient temperatures. The precipitated asphaltenes can cause fouling, plugging and foaming issues in the vessels. Some of the solvent gets trapped within the precipitated asphaltenes agglomerates, making it challenging to recover all the solvent from the tailings stream without imparting some amount of shear. In order to keep the light solvent in liquid form, PFT circuits typically run at higher pressures, requiring more expensive pressurized equipment. Twice as much paraffinic solvent is required (versus a naphthenic diluent), requiring more capacity in the Tailings Solvent Recovery Units. The low water/solids content prevents corrosion/erosion of the pipeline during transport. Although pipelines have a minimum specification of 0.5% water and solids, PFT facilities produce a much cleaner product, containing only a trace amount of water and fine residue (less than 0.1%). The viscosity specification ensures the bitumen is "pumpable", even at lower temperatures. The lower fraction of heavy-ends (reflected by the product density) ensures the feedstock can be processed through a high-conversion refinery. This requires the asphaltene content to be below 10%, reflecting a 50% asphaltene rejection rate for Athabasca bitumen (which normally has about 17% asphaltenes). The "heaviness" of the crude oil is reflected in its API density and percentage of MCR (micro-carbon residue). MICRO-CARBON RESIDUE EXPLAINED: Micro-carbon residue (MCR) is an indication of the bitumen's coking potential. A lighter hydrocarbon therefore has a lower MCR. Marketable heavy oil sold to high-conversion refinery generally contain less than 10.5% MCR. Fort Hills (under construction, operated by Suncor Energy). Note that all facilities are very similar in design except for the Muskeg River Mine, which was the first PFT facility ever built in the oil sands. Muskeg River operates at a lower temperature than the other three facilities, which all employ the High-Temperature Paraffinic Froth Treatment (HTPFT) technology. Bitumen product from the Muskeg River and Jackpine are pipelined about 300 km to the Scotford Upgrader, located 40 km NE of Edmonton, Alberta. The bitumen still contains about 30% solvent by volume (used as product diluent), which is recovered at the upgrader and pipelined back to the mine site. The Scotford Upgrader does not have coking units but instead uses hydrogen addition to produce synthetic crude oil, mostly processed at the adjacent Scotford Refinery. Note that diluted bitumen produced at both Muskeg River and Jackpine is marketable (saleable on the open market). A small fraction of that production is stripped of its solvent, diluted with condensate and sold directly to high-conversion refineries. Both Kearl Lake and the upcoming Fort Hills PFT facilities are intended to produce a fungible bitumen product that is diluted with condensate and sold directly to market. This partially-deashphalted diluted bitumen can be purchased by any high-conversion refinery without an intermediary upgrading step.